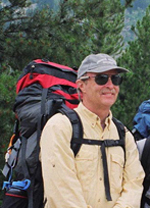 Over the course of his 35 year career, first with the National Park Service (1973 – 1994) and then later with the U.S. Forest Service, Dave Parsons made significant contributions to research and science at Sequoia and Kings Canyon National Parks (SEKI). Dave completed his stellar career by serving as Director of the Aldo Leopold Wilderness Research Institute, the only Federal research group in the United States dedicated to developing and applying knowledge to improve the protection and management of wilderness in America. Throughout his more than 20 years as Research Scientist at SEKI, Dave conducted original research as well as solicited, coordinated and facilitated research performed by a wide variety of cooperators, and built a model program of placed-based research. Throughout his work in SEKI, Dave personally contributed to and promoted greater understanding of the a full range of natural resources, beginning with what those resources were like pre-settlement and extending to the infinite variety of modern-day impacts on the full range of park resources. Dave fully appreciated the limits of a single scientist, and focused much of his energy on building a program that became a model for parks in the NPS Western Region and beyond, one that created long-term support among a very diverse group of academic and government partners. He was an active member of the SEKI management team and an effective advocate for integrating research into day-to-day park management actions. In addition, Dave’s efforts on behalf of NPS science and resources management included many years of service on the Board of the Directors of the George Wright Society. Finally, throughout his years as Director of the Aldo Leopold Wilderness Research Institute, Dave was an tireless and effective on the national and international stage for science-based stewardship of wilderness. He currently holds the position of emeritus scientist with the NPS.